Travellers on the classic Cape to Cairo overland trip, often say the best food they encountered on their journey through Africa was unexpectedly in the country perhaps better known for its tragic famines, ever since those images of starvation in Biblical proportion hit the world’s front pages and magazine covers in the mid-1980s. Ethiopia has a rich gastronomy. The country is undergoing an election this May. The last one was disastrous and sent more than a few refugees to South Africa. Cape Town’s industrious and entrepreneurial African refugees fuel several small cafeterias in the city these days. There’s Aaron’s West African Food on Loop Street (which opened in March), and Cafe Zanzibar at 96 Castle Street, where they serve fish, chicken or beef with white/brown rice, green banana or pap for R30; soup is R15. Thanks to their distinctive cuisine, Ethiopian restaurants are found all over the world, from Sydney to Vancouver, even Beijing. Addis in the Cape, was opened by Senait Mekonnen in 2007. Located in a fine heritage building, with cheerful awnings outside, the interior is designer distressed, with exposed brick and intentionally dilapidated plaster. The chairs, decorations and fabrics are authentically Ethiopian, but displayed to catch the tourist eye. The waitress brings a jug of water and napkins to wash and dry your hands sitting at the low, round, traditionally woven wicker tables. Ethiopian food is communal and eaten without utensils. Instead, you scoop up the food with a unique pancake bread, about 50cm in diameter, called injera. An injera also forms an edible tablecloth on which various dishes and spices are upended; once you’ve eaten this too, the meal is officially over. The method is to tear off a palm-sized portion, and with the stippled side of the injera down use your fingers like a mouth, capturing several samples of sauce and comestible, then scoop the parcel into your chops. Injera is a slightly spongy, velvety, sourdough flatbread; in Ethiopia, exclusively made from teff, one of the tiniest grains in the world, almost gluten free, growing in the highlands. Abroad, teff is usually substituted with rice flour. It is often fermented for a day or two before use. The lack of gluten is why the bubbles form quickly as the dough heats in the pan, giving it that characteristic porous side and smooth underside. The usual accompaniments for the injera is berbere (a powder mix of chilli and a huge variety of other spices), kibe (a clarified butter), and wot – stews with sautéed chopped red onions, and either beef, chicken, fish, lentils or vegetables. The vegetarian wots are around R80 and the meat ones R90. The portions are very modest and you’re probably better off with the set menus at R150. Addis is something of a tourist trap, trading on novelty with locals, but not many readers of this column I think will want to venture a few blocks up Long Street to Cuisine Africaine, downstairs in the African curio market, where you can have exactly the same, and to my taste buds far tastier, dish for just R25. The restaurant tables are cheap, melamine office desks. There is a fridge for cool drinks (no winelist here); air-conditioning, and amateur art on the walls. The waitress brings a jug of tap water and glasses. The open, makeshift kitchen, with the pantry out on the backstreet pavement, might not be up to health regulations, but the food is certainly good, and to date I haven’t had any stomach complaints. Although I’ve seen people eating plates of pap and meat, and fish heads, I’d stick to the Ethiopian menu. 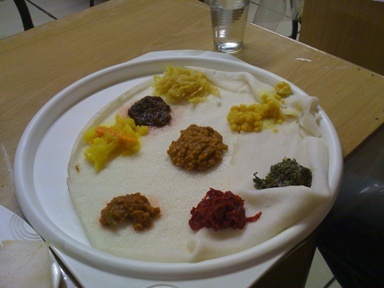 The injera arrives on a plastic white tray. The vegetarian option has a mosaic of berbere, split chickpea dhal; cabbage and onion mince with chili; turmeric potato and carrot; brown lentil; spinach; red cabbage; and a delicious, garlic-rich paste. The meat option is a spicy beef stew with a lingering after taste. If a restaurant is really about the food for you, well then, lunch for R25 and no expectation to tip, anybody? Cuisine Africaine, downstairs in the African market at 80 Long Street, Cape Town. No telephone.